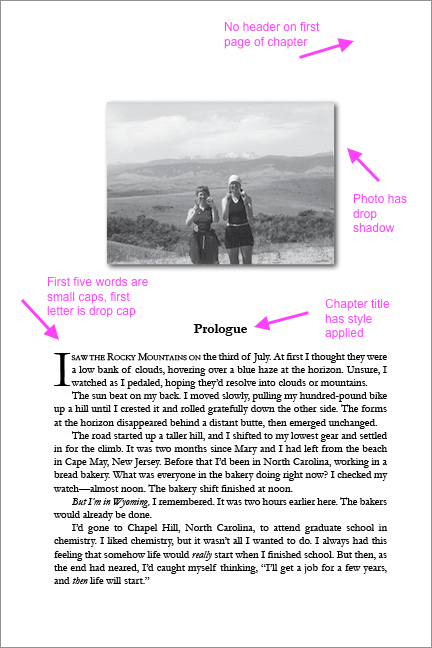 I recently designed my second book, Somewhere and Nowhere, using Adobe InDesign for the page layout. Given the additional ten years of InDesign experience I’ve gained since my first book (when I was basically at level 0), things went much more smoothly this time. I hadn’t attempted to format any text ahead of time in Word, and I used styles and added flourishes like drop caps. I took notes so that I’d have a guide to follow next time. I am sharing them in the hope that they might be useful to other self-publishers. Please note: three of the images in the EPUB version would not convert properly, no matter what I tried. You can see them but they don’t look quite right. This entry was posted in My News on December 13, 2016 by Emily.